This easy-to-use, low-maintenance blender includes a backlit LCD and acrylic flow meter, smart alarms, DC power port, extended battery life, and more—all backed by the Maxtec two-year warranty. 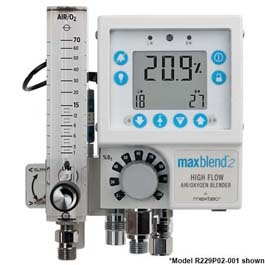 Maxtec combines their advanced air/O2 blending technology with their globally acclaimed oxygen monitoring technology. Maxtec offers the Low-Flow and High-Flow blender with a built-in monitor that allows you to measure oxygen percentage in a clean and dry environment, away from the patient.